The Fourth of July is one of my favorite holidays. I love the history, the parades, the feeling of patriotism, the fireworks, the unity, and the traditional foods. Everything about the day makes me really happy. Eliza has been anxiously awaiting the local parade. It isn't very big, but the kids have a good time watching the horses and floats. 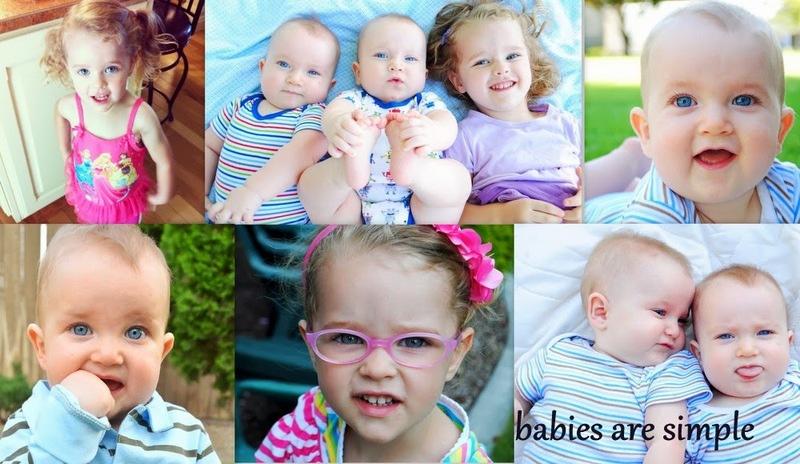 They also love all the candy that is thrown out. Eliza was so excited about wearing her "flag dress." She asked me to take picture of her modeling the dress, but then acted all shy once she saw the camera. We headed to Main Street, and the festivities soon began. 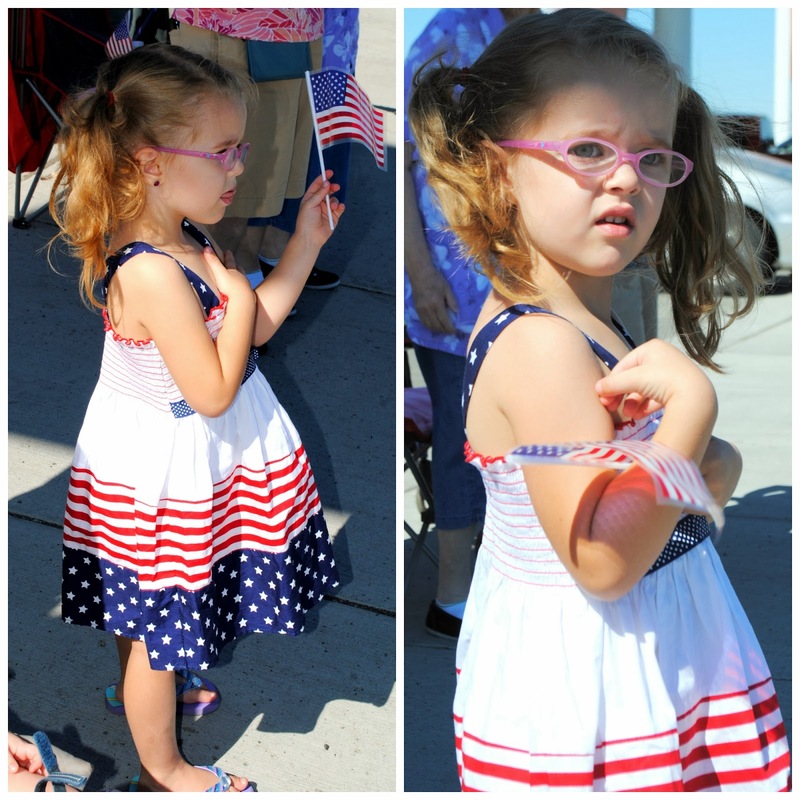 Eliza remembered to put her hand over her heart during the National Anthem which made me pretty proud. We had told her that covering her heart was a sign of respect, and she took it very seriously. If you guessed that the Taco Bell Fire Sauce man was the highlight of today, then you would be correct! Elliott wasn't too entertained, and Ezra feigned moderate interest. Eliza, on the other hand, had the time of her life. Her best friend from Othello, Ahnna, was also there, and they ran around collecting handfuls of candy. Afterwards, Nathan and I took her to the carnival at the park, where she jumped in a bounce house and got a shaved ice. What says Fourth of July more than rainbow shaved ice? We headed home for a wonderful cookout and enjoyed our flag cake that a girl from church taught Cheryl and I how to make. I love this cake! Each slice is a little flag. How neat is that!? We ended the evening by watching the firework show from Rex and Cheryl's balcony. We came inside for ice cream and then watched Independence Day. I somehow forgot to bring the movie from home, so I had to go to Walmart and buy another one (I now have three copies). I couldn't fully appreciate the day without watching that movie! 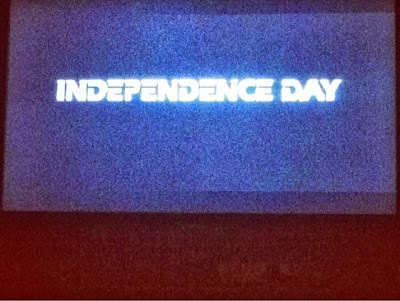 It's not Independence Day unless Bill Pullman says so. It was a pretty perfect day. It's good to be home in Othello with friends and family. What a fun day! For some reason, it's hilarious to me that you watch Independence Day every year. You're awesome. Othello is pretty darn cute. It looks like such a great day, especially the shaved ice. We'll have to meet you there next year! !